Elegant in its softness and hand-work throughout, Mayfair, offers customers tailoring that rivals the best of London, Milan and Naples. Each Mayfair suit demands over 22 hours of workmanship and features hand-sewn components in the most important areas of the garment. We are dedicated to the mens clothing industry. We blend our knowledge of style and trends with your wants and needs. Our access to design software creates a fun, modern approach to shopping from entry level to luxury. Founded in 1971 and listed on the Turkish Stock Exchange in 1995, SÖKTAŞ is a specialist designer and producer of cotton and cotton blended fabrics. Their reputation was built on shirting fabrics which are exported around the world and they have broadened that expertise into fabrics for contemporary jackets, trousers. Make a coat a little more special? A custom lining! 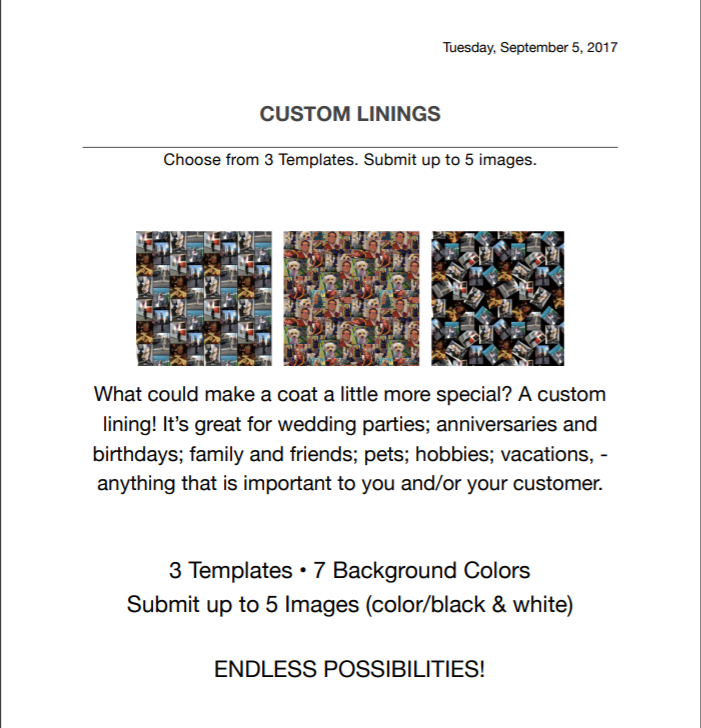 It’s great for wedding parties; anniversaries and birthdays; family and friends; pets; hobbies; vacations, - anything that is important to you and/or your customer. Printed on a rich viscose blend Paragon Prints offer you and your customer a silky luxurious feel with a distinctive pop of personality. Choose from 49 different patterns including Sunset, Stormy Weather and Cosmos. Scroll down and open link to view the options.